The spirit that turned cowboys into legends, cattlemen into men of fortune and oilmen into giants lives on in Duncan, Oklahoma. 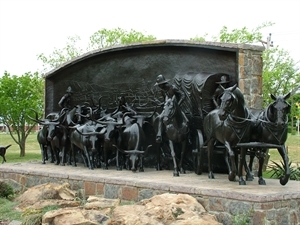 Originally a small trading post at the intersection of the Chisholm Trail cattle road and the military passage between Ft. Arbuckle and Ft. Sill, Duncan's rich heritage includes the earliest explorers to Native American settlements to US Calvary patrols, to the lands run,oil and modern manufacturing. Everything started with William Duncan, a Scotsmand who brought his family to the area after learning that the Rock Island Railroad was extending its line from Texas to Kansas. Cowboy camps, spawned by the cattle drives, were plentiful in the area around Duncan because of the lush grasses of the sweeping plains. He built a trading post that served the first train passengers that arrived on June 27th, 1892 and the new town was born. The first economy in the area was based on cotton and cattle but beginning around the 1920s the oil industry quickly brought greater prosperity when the county's oil fields became and remained Oklahoma's highest producing area until the 1980s. Halliburton Industries Inc started in Duncan, and was the key reason the city's population boomed from the 1920s to 1930. Halliburton remains an integral part of the community and provides many employment opportunities. Today, Duncan's history is to be found at the Chisholm Trail Heritage Center, a top western museum in the nation, as well as the Stephens County Historical Museum, 905 Train Depot Museum and the famous Prairie House. Historic Main Street Duncan features unique boutiqe shopping, antiques galore and tea rooms as well as a Stepping Stone trail that tells the city's history and keeps the 1950s style downtown full of hustle and bustle. Four area lakes provide recreation and RV camping opportunities and the near pefect year round weather always makes time for golf at one of the three golf courses. Seventeen parks offer trails and outdoor green spaces to enjoy. The city's dining provides visitors with mom and pop classic diners to well known restaurant chains, with something for everyone's tastes. Stay at The Lindley House Bed and Breakfast, awarded a prestigious RedBud Award for Outstanding Lodging Property by the Oklahoma Travel Industry Association, or one of the other hotels or motels in the community. Make certain to check out the Top Things to Do in Duncan, and check the list off one by one. Whether traveling solo or with family, Duncan is sure to make you glad that you stopped by to experience why Duncan is the Heart of the Chisholm Trail. Includes Cities/Towns: Comanche, Duncan, Marlow. Duncan will keep visitors busy with the four area city lakes that offer facilities and areas where camping, boating and fishing are available and nine city parks. Three golf courses and a disk golf course are always ready for play with short mild winters and 300 plus days of sunshine ensuring tee off at any time. Two splash parks and the Kiwanis Kiddieland, home to a tilt a whirl, carousel, train and more, are open seasonally. Festivals and special events like the Trail Dance Film Festival, Cruisin' the Chisholm Trail Car Show, World's Largest Garage Sale, Chisholm Trail Municipal Band outdoor concerts and the Dodge Ram Prairie Circuit Rodeo Finals are just a few of the events are happening each and every month so be certain to check www.duncancalendar.com to get the latest postings. There is always something to do in Duncan, with a vibrant arts community offering live theatre and live music concerts through Duncan Little Theatre and The Chisholm Trail Arts Council, not to mention the festivals and year round events. Duncan is home to a thriving arts community. Duncan Little Theatre, the Chisholm Trail Arts Council and the Duncan Art Guild provides plays, concerts, art shows and plenty of opportunities to be involved as a patron or a volunteer. Known as the antiques capitol of Southwest Oklahoma and home to many unique boutiques, there are always gems to discover and treasures to take home. Renowned museums and traveling exhibits will entice you to return time and again and the state of the art recreation and convention center complex, The Simmons Center, is unmatched by any community of the same size in the nation. The 750 seat theatre hosts many of the plays and concerts, as well as providing meeting space for groups up to 800 people. The Stephens County Fair and Expo Center provides quality space for a varitey of agricultural events. Red River Transport provides scheduled bus routes Monday-Friday and taxi service is available seven days a week. Duncan's airport welcomes jet fuel and gas airplanes with a 6,600 ft concrete runway service. Ameircan Airlines flies into Lawton Ft. Sill, 35 miles to the west of Duncan. Duncan Regional Hospital is a new, up to date, technologically advanced medical facility that includes six separate buildings that provide comprehensive medical care. Sanford Children's clinic offers quality pediatric care. The Cancer Centers of Southwest Oklahoma ensures that treatments occur right here at home. Urgent med provides walk in clinic services. Jan 27.8 F° 39.8 F° 51.8 F° 1.1 "
Feb 31.8 F° 43.9 F° 56.0 F° 2.2 "
Mar 41.0 F° 52.9 F° 64.8 F° 3.0 "
Apr 49.3 F° 61.4 F° 73.5 F° 3.4 "
May 59.0 F° 69.8 F° 80.5 F° 5.5 "
Jun 66.8 F° 77.5 F° 88.3 F° 4.7 "
Jul 70.8 F° 82.0 F° 93.3 F° 2.7 "
Aug 70.5 F° 82.1 F° 93.8 F° 2.9 "
Sep 62.5 F° 73.8 F° 85.0 F° 3.7 "
Oct 50.8 F° 62.9 F° 75.0 F° 4.0 "
Nov 39.8 F° 51.4 F° 63.0 F° 2.5 "
Dec 29.8 F° 41.4 F° 53.0 F° 2.0 "
Over 300 days per year of great weather for all activities. Spring has an abundance of flowering trees and summers are perfect for lazy days at the lake or poolside. Fall wraps ups the crapemyrtle season in Duncan and winters are mild, with golfers taking full advantage of the seasons to golf anytime. Condos Over 50 Communities Duncan offers charming old town houses in the historic downtown district to expansive homes in private neighborhoods. New construction to historic homes are available as well as other options like condominiums and duplexes. Home care Senior center Visiting nurses Three senior citizen centers offer a variety of services and The Simmons Center provides a multitude of activities and classes for seniors. There are limitless opportunities to volunteer in Duncan, with multiple non profits. Any interest, any free time is certain to be welcomed by the various organizations that make Duncan a special community.